Brian Kindregan claims that cutscenes can be used to tell stories in ways gameplay can't. Back in the day, being cinematic in a videogame was simple. The original Ninja Gaiden impressed many players with its cutscenes, many of which were little more than slideshows. Since those early days however, the prominence of in-game cutscenes would grow. Some of the most memorable moments of many titles would be ones that gamers were restricted to watching. That hasn't been the case as much in recent years. As videogames have evolved, so too has the ability of gameplay to match, in terms of storytelling, traditional cutscenes and cinematics. In turn, many developers have moved away from cutscenes and more into integrating story moments into gameplay itself. Some in the gaming industry have gone so far as to label the mere inclusion of a cinematic as being a failure on the part of the developer. 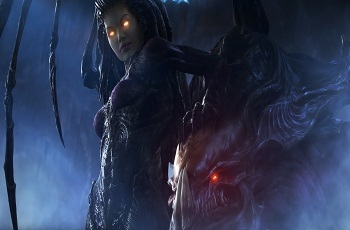 Contrary to this belief, Brian Kindregan, lead writer for StarCraft 2: Heart of the Swarm, recently defended cinematic sequences, citing their ability to give life to simple sprites and focus to a game's story. "When we put the story in a scripted scene, like a briefing or debrief, we are telling players that this is important, we're trying to make you look at it," said Kindregan, speaking at a GDC panel. "But it doesn't necessarily mean it's a huge, impactful moment when a story turns. So when we put story in a cinematic, we're telling players it's very important. It indicates what kind of story the player is about to get." Kindregan admits that a cinematic on its own isn't always a good thing, stating that too many cutscenes, poorly executed ones, or even good cinematics that are out of step with the feeling of the gameplay, can be potential detractors from an experience. "The cinematic needs to leave players in a spot that makes them think, 'Great, I want to go hit play now,'" he said. "But the emotion of the end is wide open: you can have humorous, violence, bittersweet, sad, happy, all of those are on the table. The only thing you can't modulate or mess with is the tempo." While the examples that Kindregan cites come largely from his experience with StarCraft 2, they are lessons that could easily be applied across the spectrum of gaming genres. Storytelling is one of the challenges that many developers continue to struggle with, and while better writing would certainly be a help to many studios, knowledge on how to better present stories to gamers could perhaps go even further.